The second instalment to Wildcard Saturday saw an underdog team come alive, they were hungry for a win and they ate. The Ravens defense started out how they planned by forcing a punt on the first drive but right after that the Ravens offense went three and out. Suisham kicked a 45 yard FG for the first points of the game right after a 3 and out for the Ravens. But Benard Pierce scored a 5 yard TD that put 6 on the scoreboard for the Ravens. Pittsburgh then put another 3 points on the board that put them down by one. Justin Tucker answered right back when he hit a 28 yard FG of his own. Suisham kicked a 47 yard FG to end the half and the Ravens were up 10-9 going into the locker room. Ravens put 3 points on the board to start off the half and went up 13-9 after that. The Steelers punted and the Ravens were in business when Joe Flacco threw a laser pass to Tory Smith for 11 yards to go up by two scores. Pittsburgh punted once again but the hue defense caught them gave them life after they made Forsett fumble. Big Ben finally found his target Antonio Brown for 45 yards and landed on Baltimores 1 yard line. Two plays later, Ben found Martavis Bryant on a fade route in the end zone for 6. Pittsburgh would then go for two but would convert. After a clutch 52 yard field goal made by Justin Tucker, Ben threw a costly INT that Terrell Suggs caught in his lap and brought it into his hands forwardly. One play later, Joe Flacco found Gillmore for 21 yards for a TD and was the dagger. The Steelers were down 30-15 at this point and had life, but Ben threw another INT and it was the game. They ended up getting a safety at the end of the game but the Ravens would come on top, 30-17. They will go to New England to face the number one seed, the New England Patriots. Flacco had himself a day as he threw for 259 yards, and two TDs. He also went 18-29 and had a Passer Rating of 114. He picked apart that secondary and so did Steve Smith who grabbed 5 balls for 101 yards and a TD. Ben played bad as he threw 2 INT, 1 TD, 334 yards and went 31-45. He had costly mistakes on key drives that could've put the Steelers in a better position to score. 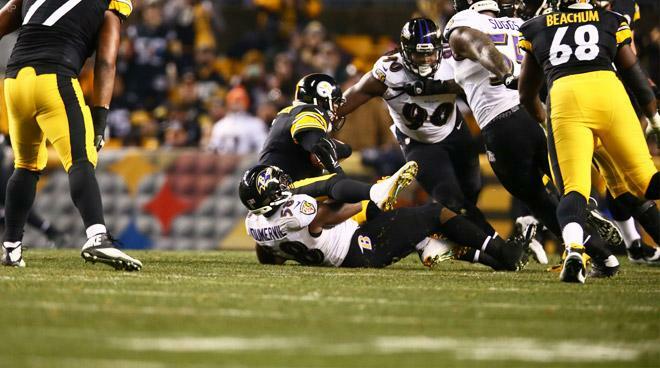 The final score, Ravens 30-17 Steelers.